Election 2012 was marred by problems for voters nationwide. One year later, an encouraging number of states have taken steps to provide voters more access to the ballot box, but others have still tried to restrict access. 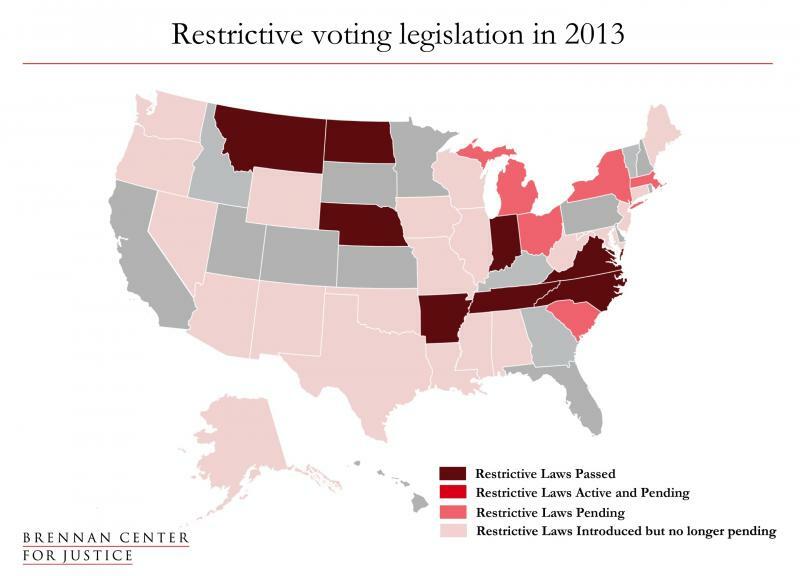 Also see our roundup of voting law changes in 2012  and 2014 . Election 2012 was marred by problems for voters nationwide. The northeast was beset by Superstorm Sandy, displacing hundreds of thousands of registered voters on Election Day. Across the country, millions of Americans stood in long lines at crowded polling stations to exercise their right to vote. One year later, an encouraging number of states have taken steps to provide voters more access to the ballot box. At least 237 bills were introduced in 46 states to increase access. Unfortunately, others have restricted access — 33 states introduced 92 restrictive bills — and the Supreme Court has made it easier for some of them to do so by striking down a key provision of the Voting Rights Act. 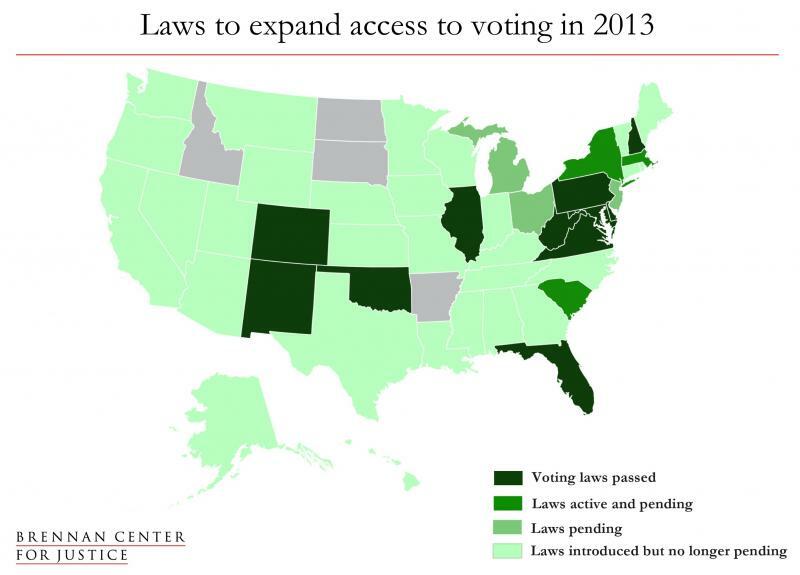 While 10 states passed 13 bills in 2013 to expand voting opportunities, eight states passed nine restrictive laws. We will continue to monitor voting changes in the lead up to the 2014 legislative session. Already, four states have pre-filed election bills we will be watching with interest next year — including three measures to restrict voting, and six to expand it. Of those, 5 restrictive bills are currently active in 2 states,  in that there has been legislative activity beyond introduction and referral to committee (such as hearings, committee activity, or votes). Note: In the cases where more than one piece of restrictive legislation has been introduced in a state, the map reflects the state’s passed, active, or pending status based on its most active piece of legislation. Photo ID required to vote (legislature overrode gubernatorial veto). Authorizes challengers to demand proof of identification. Referendum to repeal Election Day Registration, placed on the ballot for 2014. Reduces the early voting period. Photo ID required to vote, eliminates same-day registration, eliminates pre-registration for 16- and 17-year-old citizens, reduces the early voting period. Photo ID required to vote. More restrictive Photo ID requirement. Restrictions on third party registration. Photo ID laws. At least 25 states introduced legislation either requiring voters to show photo ID at the polls or making existing photo ID laws more restrictive. Proof of citizenship laws. At least eight states introduced legislation requiring proof of citizenship, such as a birth certificate, to register or vote. Making voter registration harder. At least eight states introduced bills to end Election Day or same-day voter registration, limit voter registration mobilization efforts, and reduce other registration opportunities. Reducing early voting opportunities. At least eight states introduced bills that limit existing opportunities to vote early in person. Making it harder to restore voting rights. At least two states introduced legislation that would further restrict the right to vote to persons with criminal convictions. Making it harder for students to vote. At least two states proposed legislation that would make it harder for students to register and vote. Note: In the cases where more than one piece of expansive legislation has been introduced in a state, the map reflects the state’s passed, active, or pending status based on its most active piece of legislation. A new influx of bills to enhance voter access drew support on both sides of the aisle. Preregistration of eligible 16- and 17-year-old citizens. Constitutional amendment expanding opportunities for people with criminal convictions to regain their right to vote. Expansion of early voting opportunities. Expansion of early voting, same-day registration during early voting, study methods to reduce long lines at the polls. Existing photo ID law made less restrictive. Automation of voter registration at the DMV office. Identification Laws. At least 11 states introduced bills that would relax existing voter ID or proof of citizenship laws. Modernizing Voter Registration. At least 26 states introduced bills that would modernize the voter registration system, in whole or in part, and make it easier for eligible citizens to register. Broad-based modernization. At least four states introduced wide-ranging legislation to modernize the voter registration process using a combination of technology and fail-safe protections. Both houses of Congress introduced comprehensive bills to modernize voter registration. Automation. At least six states introduced legislation that would introduce or expand automation of the voter registration process at government agencies. Online registration. At least 13 states introduced bills that would establish or enhance the use of online registration systems. Same day registration. At least 19 states introduced bills that would allow voters to register on the same day they vote. Same day registration (SDR) bills can vary in that some allow same day registration on Election Day only (EDR), some allow it during an early voting period only, and some may allow both options. Portability. At least four states introduced bills that would allow a voter’s registration to move with her when she moves to a new address in the state. More early voting opportunities. At least 20 states introduced bills that would newly introduce, or expand, opportunities for early in person voting. While New Jersey passed a bill to introduce early voting in the state, Governor Christie vetoed it on May 9, 2013. Restoring voting rights. At least 14 states introduced bills that would expand opportunities for those with criminal convictions to regain their right to vote. In Virginia, Governor Robert McDonnell issued an executive order automatically restoring the right to vote upon completion of sentence for those with past non-violent criminal convictions. Pre-registering students to vote. At least 13 states introduced bills that would allow students under the age of 18 to pre-register, so that upon turning 18 they are registered to vote. Reducing long lines. At least four states introduced bills that aim to reduce waiting times by requiring, or assessing, the implementation of minimum standards for efficient polling place administration. States are already beginning to file bills in preparation for the 2014 legislative session. At least four states have introduced voting laws we will be watching. In Missouri, three bills have been pre-filed that would require voters to show photo ID at the polls. In Kentucky, three bills have been pre-filed that would restore voting rights to persons with past criminal convictions. A bill that would restore voting rights was also pre-filed in Virginia. In Florida, two bills have been introduced that would make it easier for eligible citizens to register to vote. Check back here for regular updates on what we can expect in the next session. Massachusetts, New York, Pennsylvania, South Carolina. Alaska, Arkansas, Connecticut, Illinois, Indiana, Iowa, Maryland, Massachusetts, Michigan, Missouri, Montana, Nebraska, Nevada, New Jersey, New Mexico, New York, North Carolina, North Dakota, Ohio, Oklahoma, Tennessee, Virginia, Washington, West Virginia, Wyoming. Massachusetts, Missouri, Nevada, Oklahoma, Oregon, South Carolina, Texas, Virginia. Alabama, Montana, Nebraska, New Mexico, North Carolina, Ohio, Texas, Virginia. Arizona, Indiana, Nebraska, North Carolina, Ohio, Tennessee, Texas, Wisconsin. As of December 18, 2013, a bill is still active in Ohio. Although the New Hampshire bill is not expansive with respect to current law, it eases certain requirements that had not yet been implemented, but would have gone into effect September 2013 under a restrictive photo voter ID law passed by the legislature in 2011. Alabama, Indiana, Kansas, New Hampshire, Oklahoma, Pennsylvania, Rhode Island, South Carolina, Tennessee, Texas, Wisconsin. Alabama, Alaska, Arizona, Colorado, Delaware, Florida, Georgia, Hawaii, Illinois, Maryland, Massachusetts, Michigan, Montana, Nevada, New Mexico, New York, North Carolina, Ohio, Oregon, Pennsylvania, Tennessee, Texas, Utah, Vermont, Virginia, West Virginia. As of December 18, 2013, bills remain active in Massachusetts. Colorado, Massachusetts, Nevada, New York. As of December 18, 2013, a bill remains active in Massachusetts. Florida, Hawaii, New Mexico, Oregon, Texas, West Virginia. Florida, Illinois, Massachusetts, Michigan, Montana, New York, North Carolina, Ohio, Oregon, Pennsylvania, Texas, Virginia, West Virginia. As of December 18, 2013, bills are still active in Massachusetts and Pennsylvania. Alabama, Alaska, Arizona, Delaware, Georgia, Hawaii, Illinois, Maryland, Massachusetts, Nevada, New Mexico, New York, North Carolina, Pennsylvania, Tennessee, Texas, Utah, Vermont, Virginia. As of December 18, 2013, a bill remains active in Massachusetts. Florida, Massachusetts, New York, Oregon. As of December 18, 2013, a bill remains active in Massachusetts. Connecticut, Florida, Georgia, Illinois, Maine, Maryland, Massachusetts, Minnesota, Mississippi, Missouri, New Jersey, New York, North Carolina, Oklahoma, Pennsylvania, Rhode Island, South Carolina, Tennessee, Virginia, West Virginia. As of December 18, 2013, bills remain active in Massachusetts, New York, and South Carolina. California, Delaware, Florida, Iowa, Kentucky, Louisiana, Minnesota, Mississippi, New Jersey, New Mexico, New York, Tennessee, Virginia, Wyoming. California, Colorado, Connecticut, Hawaii, Iowa, Massachusetts, Michigan, Nebraska, New York, Ohio, Oregon, Texas, Washington. As of December 18, 2013, bills remain active in Massachusetts and New York.